A house can be immediately transformed to a home when it is revamped with the apt home decoration items. You can give your home a nice makeover by changing the theme every now and then. We don’t always have to buy these décor products each and every time we think of bringing in changes to your decor and spend lot of money on it. 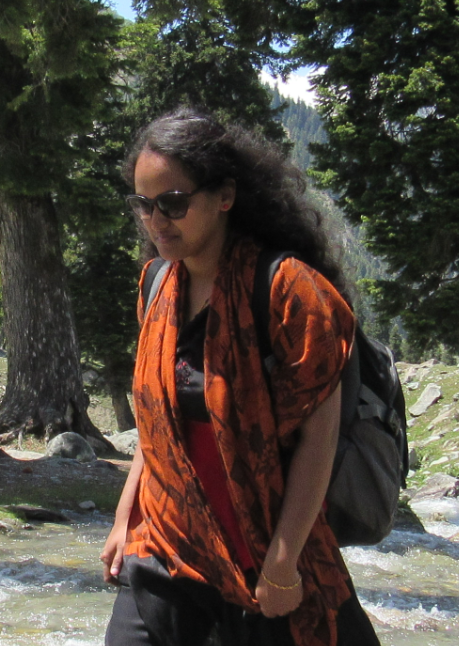 We can do so by not burning a hole in the pocket and get a new improvised look constantly. Do-it-yourself, also known as DIY, is the activity of decorating, building, and modifying and repairs at home by ourselves rather than employing an expert. Nowadays a trend has been set to DIY each and every possible thing at home from kitchen gadgets to mirror frames to fashion, clothes and everything. 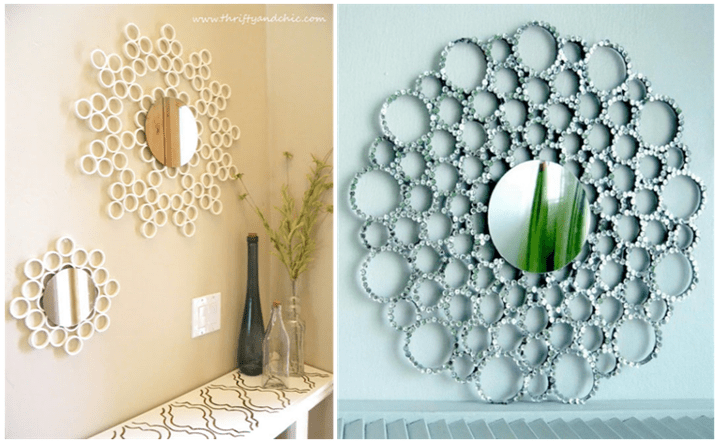 One such trend is the DIY mirror decoration. 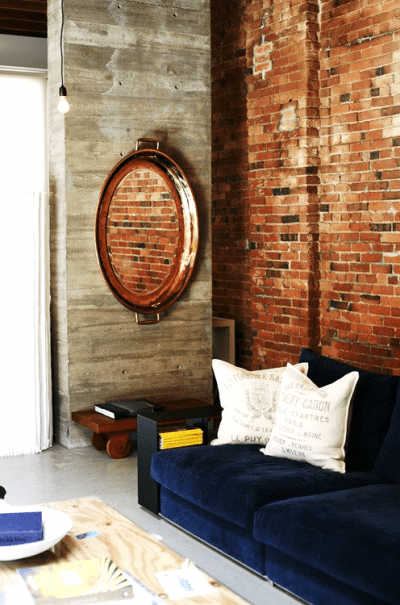 In my previous article, Pep up your home with mirror decorating ideas, I had talked about how various mirrors transform your room to style and glamour. 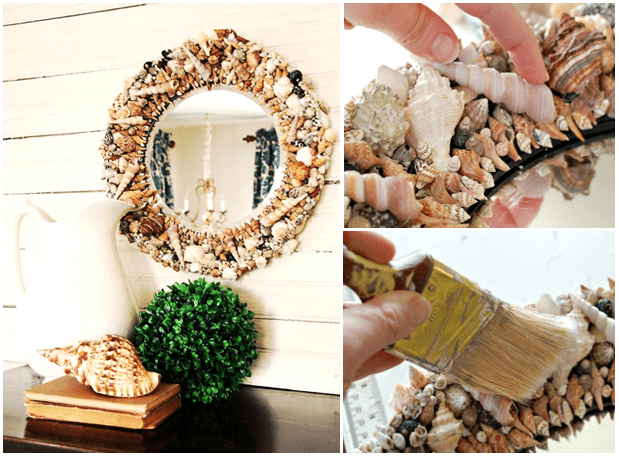 Here I would show some easy and simple DIY ideas for mirror frame decorations so that incorporating these would be less expensive and would serve the urge of changing the look of the home decor periodically. 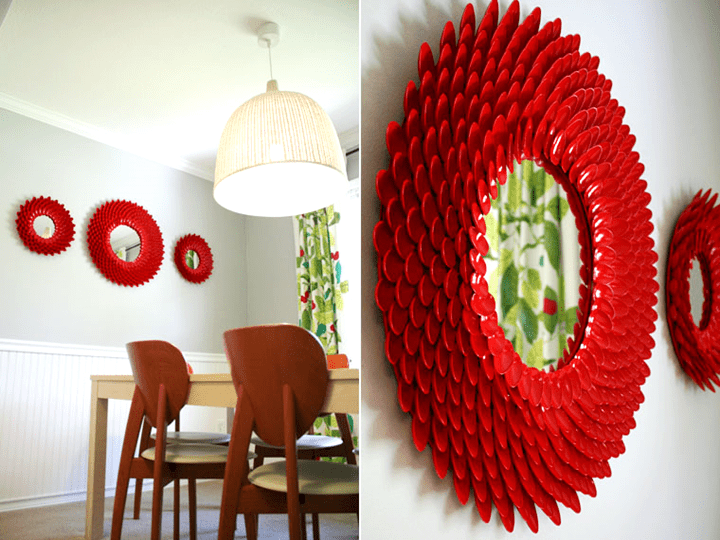 A fun way to create a pretty mirror or a wall feature is to hang a racket mirror on your wall. Just take an old racket to a hardware or glass shop and ask for a custom oval shaped mirror that fits inside the racket. Then put liquid nails on top of the strings and press the mirror down gently. Let the glue dry overnight and hang your new racket mirror with a nail. Another method is to take off the racket strings, sand it down with a sand paper, then polish or varnish it for a better finished look and leave it to dry. Now place a perfectly custom oval shaped mirror and stick with glue to the racket. Place a wooden plank with a closed eye bolt hook and stick it to the back of the mirror and voila! Hung it up and flaunt your wall in style. Hanging this DIY spoon mirror is a gonna wow your home. They are surely going to steal your show. Making this is simple and cheap. First separate the spoons from the handle. Glue a mirror in the center of heavy round cardboard. Cover the mirror with a paper. Glue the spoon starting from the outer part of the cardboard leaving some space in between and go on pasting towards the edge of the mirror. Take it outside and spray a coating of primer on them. Leave it to dry. Then paint any color according to your choice and color combination. Let it dry, take the paper covering off the mirror. If you feel the spoon edges around the mirror doesn’t look nice then cover it up with beads or button. Isn’t this sunburst mirror look amazing. Do you know this doesn’t cost a bomb? They are made out of PVC pipe!!! Yes, yes you heard it right. Now to make this is a bit of hard work but mind you the end result is just wonderful. Cut the pipe into half inch thickness. U can either get the job done outside at a store or u could do it yourself but safety first while handling this. Spray paint them and let it dry. Lay them according to your desirable choice of design and start gluing them together. Once it’s done, glue the mirror on the pipe and its done!!! You can glue beads, buttons, sparkles on the pipe to give it a more sophisticated look or you can attach small mirror or paint on alternative pipe to give it a patterned look. Hang this beautiful piece in your living room and transform your wall to style and glamour. If wild and bold is your style, then these mirror would be a perfect fit for your home. Bring in a theatrical touch to your home by making this mirror and placing it anywhere in your home. To make this mirror, all you got to do is take a bigger plain frame mirror and gently glue the patterned cloth on to it. You can take any wild printed patterned cloth like zebra, leopard, tiger design or even give it a safari look. Or you can cover the mirror with a paper and spray a coat of primer on the frame, let it dry and then paint big bold wild patterns. It is sure to bring pizzazz to your home décor. Who would have thought that serving trays can be of this use, right? This is the simplest of all. Just take any serving trays, pep it up or use as it is and attach an accordingly custom cut shaped mirror and there you go a beautiful feature on your wall is ready. Serve it up!! Want to turn a plain looking mirror into really chic stylish look? Try this DIY button mirror and add it to your home décor. You would be surprised to see how easy and inexpensive trick can really transform your plain old mirror into a unique elegant one. 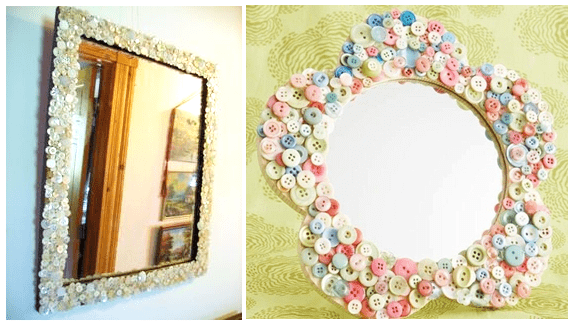 Take any plain old mirror and start gluing various buttons on to the frame. Just make sure all the gaps are filled. And bam done!! Hang it up. Decoupage the mirror frame to give it a colorful and a funky twist to your home décor. Decoupage means to have various cutout pictures, gluing them to any desired object and then coating the pictures with layers of varnish. So take any frame mirror and decoupage them. You can decoupage stamp collections, newspaper cutouts, old vintage maps or your very own personalized photos. The finished result can look so beautiful and elegant that it will look as if it is professionally painted. Mirror make a cool statement to your home décor. They can fit in perfectly anywhere in the house and yet look sophisticated, elegant and standout from the rest. Do try out these inexpensive DIY mirror tricks and let us know the experience. MIRROR MIRROR ON THE WALL, WHO IS THE BEAUTIFUL OF THEM ALL!!! Image Source: hgtv.com, littlethingsbringsmiles.com, pinterest.com, etsy.com, addicted2decorating.com, itsalwaysautumn.com, minimalisti.com, llittlepieceofme.com, prettyhandygirl.com, topdreamer.com, poindextr.wordpress.com.